The club started as a "stupid idea in the pub" in 1981. Roo Walters came to York from London and found the university didn't have a caving club and that something had to be done about it. Roo then joined the local caving club known has the York Speleological Group where he met Dave Lloyd. Not long after they formed YUCPC and had their first very first trip down Borrins Moor - and they got lost! The club grew from that point and embarked on the first expedition under the new club name in 1983 to the Picos in Spain. This began the start of regular club expeditions including several years in the Picos then later in 1995 moving to the Vercors in France then Durmitor in Montenegro in 2004. Not to mention several 'holidays' in between. Since then the club has gone through highs and lows but is still attracting members and still making new discoveries all over the world! 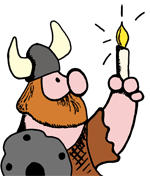 Hagar, the club mascot, was originally drawn by Roger Hart who graduated from York in 1988. It is a rip-off of Hagar the Horrible from The Sun newspaper, and has been used ever since on letterheads, club T-shirts, etc. He became colour in about 2012. Club merchandise does change every year but we try to incorporate Hagar onto it somewhere! We order club merchandise every year in the form of t-shirts, hoodies, sweatshirts etc. This normally includes a design on the back that changes annually as well as the club name on the front at one side and a personal message on the other. Since the 25th anniversary in 2006 the following five years seemed to fly past, during which time, we’ve had hundreds more caving trips, trained hundreds more new recruits, and of course generated dozens more old fart members waiting for another reunion to arrive. So it was with great excitement that the 30th anniversary of YUCPC came upon us in March 2011, and with the club being the biggest it has ever been, this was clearly going to be a much larger event than the 25th. 25 years is a long time by anyone's standards and with over 700 caving trips in the Yorkshire Dales, more than twenty expeditions worldwide, and generations trained in the skills of abseiling and rigging, we at the caving club thought it was a landmark worth celebrating! In the alcohol fuelled haze of Goodricke bar, hauling ourselves up the equivalent height of Mount Everest in a mere 24 hours seemed a brilliant idea.